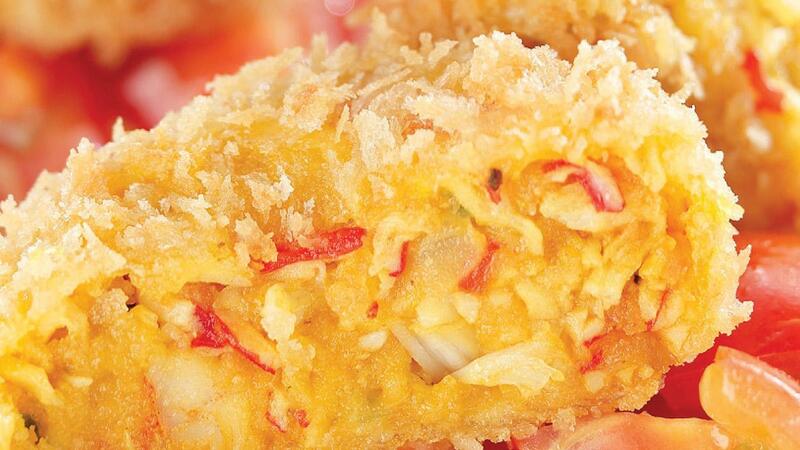 When crab meat meet prawn, onion, ginger, garlic, and chili, it will be perfect finger food for your afternoon. Fry the garlic, onions, celery, ginger and red chilies until fragrant smell. Add the fish and shrimp meat, just enter the crab. Add the chili oil, turmeric powder, and season with Knorr Seasoning Powder and black pepper, stir evenly. Insert the mixture into a bowl and wait until boiling. Stir in mayonnaise, ketchup, bread crumbs until evenly distributed. Roll mixture into balls measuring less more than 40 grams (about 15 pieces) and form into cakes. Dip balls into the cake flour and beaten eggs, then coat with bread crumbs. Fry ball cakes until golden brown, dry with paper towels and serve.